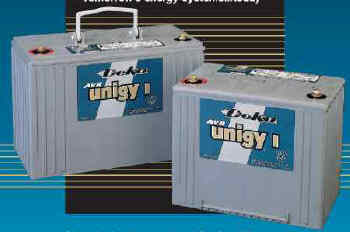 Deka Unigy I Series batteries are available as AVR (absorbed valve regulated) technology for virtually any application demand. Both are UL recognized components and are made in the U.S.A. with individually tank-formed plates for optimized uniformity of cell-to-cell voltages. • Absorbed glass-mat construction... Lowers internal resistance for superior high-rate, short-term discharges. • Tank-formed plates...Optimize cell voltage balance. • Solid copper, tin-plated inter-battery connectors with insulators...Ensure highest current-carrying capability. The Deka Unigy I line of absorbed valve-regulated, lead-acid batteries is designed specifically for high-rate uninterruptible power supplies (UPS). Available in both 75 A.H. and 100 A.H. capacities, these batteries are housed in flame-retardant, 12-volt monoblocs. I.C.A.O., I.M.D.G., I.A.T.A. and D.O.T. air transport approved.